It has been an inspirational year for Týrsday. Not only did we reach football lovers all around the world for World 11 and saw our Olympic hero's bring home some metal, we also managed to touch the hearts of Dutch parents with inspiring stories for the Steun Emma foundation. That's right, the best ideas do start on a coaster. Earlier this year a Dutch newspaper posted the very coaster that founders Mathys and Gijsbregt used as the first drawing book for Týrsday. Don't you think the resemblance of the portraits are striking? Life on the water is always better. We are fortunate enough to hold our office in a boat at the Amstel river in Amsterdam. With the warm summer sun out we decided that we would hop on another boat and hold a meeting while doing a little sightseeing. In this very meeting we laid down the groundwork for Uniek Sporten. While the temperatures dropped, the reach of the new regional platform for Uniek Sporten has gone up substantially. Magazine Elsevier saw that the Týrsday method is a winning method. That's why they decided to write a piece on us, we are always happy to contribute. There is only one way to celebrate a birthday: with cake and beer. Even for high jump athlete Douwe Amels. Sport is in the DNA of Týrsday. Therefore it makes sense that we help athelic heroes share their adventures online. We proudly represent new talents, champions and gold medal winners. 2016 was an Olympic year. Týrsday decided to support ten Olympic talents on their Road to Rio. Týrsday kept the world up to date on the accomplishements and adventures of our special Team Tyrsday. Co-founder 'Mr/Miss' Gijsbregt hopped on a plane to Brasil to support the members of Team Týrsday. Meanwhile, the rest of the Týrsday gang kept the world updated on the latest news on our athletes. Obviously we were constantly watching the matches and that led to some very exciting conversations on communication app Slack. Unfortunately one of our Team Týrsday members lost an infamous match in Rio. After a battle between titans the opponent of Judoka Marhinde Verkerk was voted as winner. The European hampion and overal warrior now speaks for companies about her experiences and will continue working hard for more Judo wins. Týrsday clients receive a custom-build website, an online strategic game-plan and content guidance. We have a warm relationship with all of are clients. Although we are a company that solely works online, we do sometimes have the opprtunity to get together with clients. The result: a lot of happy faces. Although we love sports at Týrsday (Gijsbregt: Vasa Challenge, Metten: Amsterdam arathon), we do have other interests and passions. One of them is making the world a better place. We conducted a massive research operation for solar energy system provider Sungevity. Over 200 (!) online influencers were analysed, the results lead to some pretty interesting facts and figures we must say. Check out the cool solar dress that European Sungevity VP Roebyem Anders is wearing! We kicked off 2016 with a visit to the Emma Childrens' Hospital in Amsterdam. This is the beginning of a fruitful collaboration in which together we try to reach as many do-gooders who want to donate funds to the Steun Emma foundation. In a years' time we managed to draw three times as many visitors to their website and we created a lot of activity on their social media. We do this through writing inspiring blogs, reaching out to communities outside their own and smart usage of social media. The goal? Fundraising the last 5 million euros for the new neonatology department in the hospital. We've developed their new online donating tools which is way more efficient than the old one AND very conveniently, now they don't have to pay 10% commission to the old payment provider anymore. Hey, is that Messi? Oh yes it is. Did we mention were are completely nuts about sports? We are very honoured provide FIFPRO and FIFA with this years' World11 website and voting tool. Through smart community management and the beautiful and easy-to-use Tag The Love website we have reached out to soccer fans all over the world. Over 50.000 people have made a prediction on which eleven players will be in this years' dream team. Gotten excited to predict as well? We suggest you get started. Co-founders Mathys and Gijsbregt went on a trip to Austria and Norway to present the results of a digital media audit that Týrsday conducted for the International Biathlon Union (IBU). The results help give a better insights on the digital domain, on how to regain the interest of younger audiences and to more knowledge on how to create a future-proof content and media strategy. Below you see a visual from the IBU presentation in which we illustrate the online activity and content of the IBU athletes, member federations and events. 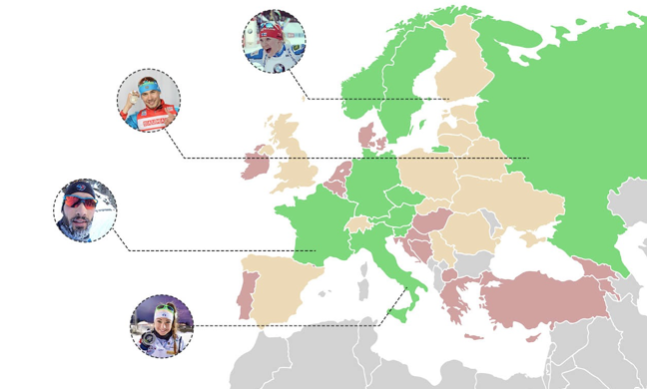 A score was given to each biathlon country: green means that the country has a strong fundament to create a biathlon community and red means that the country has a weak fundament. While at the World Championships in Oslo, Mathys and Gijsbregt met Biathlete Dorothea 'Doro' Wierer. During the research session for IBU, it showed that she has great online storytelling skills. Did you know that Gijsbregt was a professional cross skier in the 90s? For the Vasa-challenge in Sweden (for which we build a platform) the old track suit was used once more. Watch him go! At Týrsday we are a bunch of people with a lot of experience and some stories to tell. That is why we sometime share our knowledge at congresses, universities and other meet-ups. Community manager Metten saw himself standing in front of the same Auditorium where he himself as a student attended class couples of years ago. At the a congress of Dutch Royal Swimming Association, Gijsbregt also shared some insights about storytelling by professional swimmers. In 2016 all of our clients combined welcomed 3.069.886 different people to their platforms. That means that over zeven million pages were visited. 54 rowers, 35 horse riders, 25 sailors, six hockeyplayers, six cyclists, two judoka's, two runners, two beach volley players, two swimmers and one high jumper. Many of these athletes managed to take home a medal at the Olympics and Paralympics in Rio. In total 21 medals found their way back to The Netherlands. About all these succes stories we wrote many, many blogs. If you would read all of them it would take you 145.298.713 seconds = 2.421 hours = 101 days. The foundation of the succes of Týrsday exists with the technology behind it. This year we presented an easy-to-use platform management tool, through which clients can create and maintain their costum-build platforms. The management tool also integrates all of the clients' social media platforms and their digital calendars. Sharing adventures has never been easier and faster. Check out our blog to learn more about this. Have you gotten excited about our work and adventures? Do you want to see your face in this blog the same time next year? Then reach out to us and look as happy as the other Týrsday clients do. Perhaps we will share a beer and eat cake too, sounds fun. Stage Týrsday: denk jij dat jij een goed verhaal hebt?